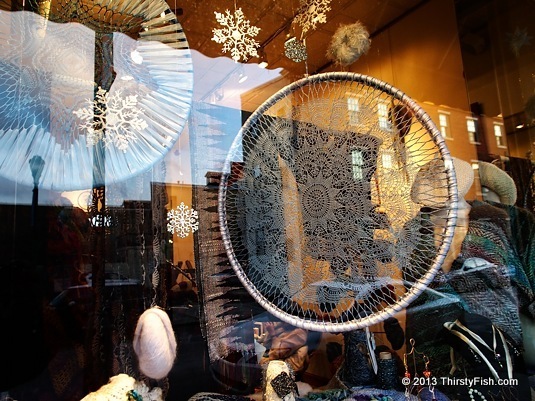 Pictured is a fiber fine art piece displayed at the Nangellini Gallery on South Street. The gallery offers, decorative and wearable fiber art, yarns, as well as knit and crochet classes. I initially thought the window piece was a dreamcatcher. In some Native American cultures, the Dreamcatcher is a handmade charm, modeled after a spider web, used to protect sleeping people from nightmares. It works by either, filtering bad dreams an letting good dreams to pass, or, trapping good dreams in the net and letting them slide down feathers. In the recent years, dreamcatchers have become popular and commercialized, prompting some Native Americans to criticize their commercialization.